Discussion in 'The Mainboard' started by Rabid, Apr 8, 2015. 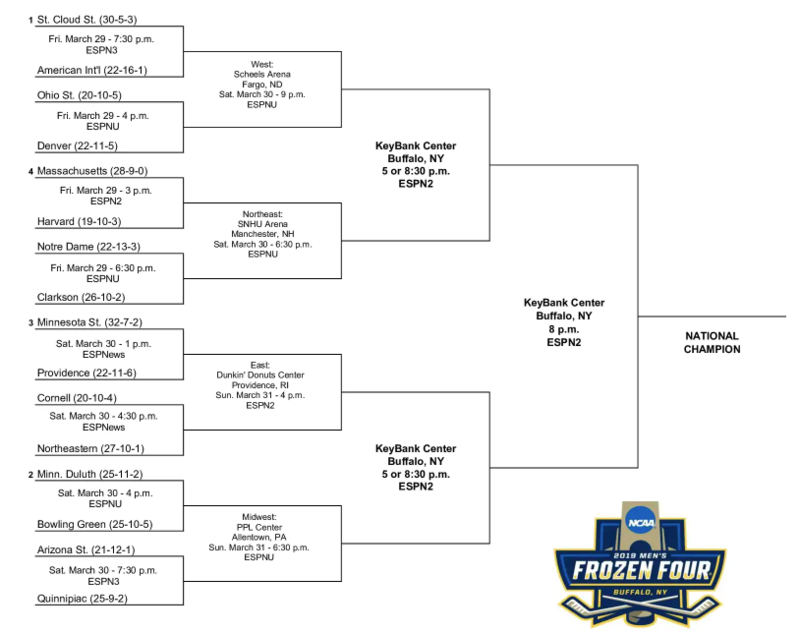 Without diving into the Eastern teams too much yet, my initial picks would be SCSU, Notre Dame, Northeastern, and UMD advancing to the Frozen Four with SCSU making it a 4th straight title for the NCHC and the 4th different team from the NCHC to win it. I think they play Northeastern for the title. Jumping on the SCSU and Minnesota St. bandwagons for the tourney. If only the Gophers had the resources and recruiting base to compete with in-state powers UMD, SCSU and MSU-Mankato. Cloud loses in the opening round as the #1 overall seed for the 2nd year in a row. The current conferences are so off balance. Oof. And 3rd time as a 1 seed in last 4 years. Should have known better than to pick St Cloud. Never underestimate the fact that St. Cloud is gonna St. Cloud...they are allergic to April Hockey. Was at the games in Fargo yesterday. When AIC scores first you could actually hear the pucker of SCSU fans Sphincters...going to be a heavy pro AIC crowd tonight. Hope they can pull it out. Jack Bauer and laxjoe like this. One period away from all in-state #1 seed Gopher rejects getting bounced in the 1st round. BGSU played really tough defense. It was a minor miracle to complete two crisp passes in succession against them. Denver just took the lead 1-0 here late in the 2nd in Fargo...AIC is actually playing with them and both teams have had chances. UMD moves along. Big 5-3 penalty kill for 1:14 when it was still 1-1 in the 3rd. So many 5 minute majors, so little discipline. Congratulations all of you UMD fans. Jack Bauer and The Banks like this. Just an unreal run the program has been on. Next season will most likely be an actual rebuilding year. It will be really difficult to replace Samberg, Anderson, Perunovich, and probably Shepard & still do well enough in the NCHC to make the tournament. Good problems to have I suppose. Rabid do you read GPL? Very rarely. I can’t recall being in the site in the last year. I am subscribed to the podcast so I listen to that from time to time. I recently started browsing through it mainly for the recruiting info after not visiting in probably at least a decade. Man has the board's general mentality shifted, at least from what I remember.